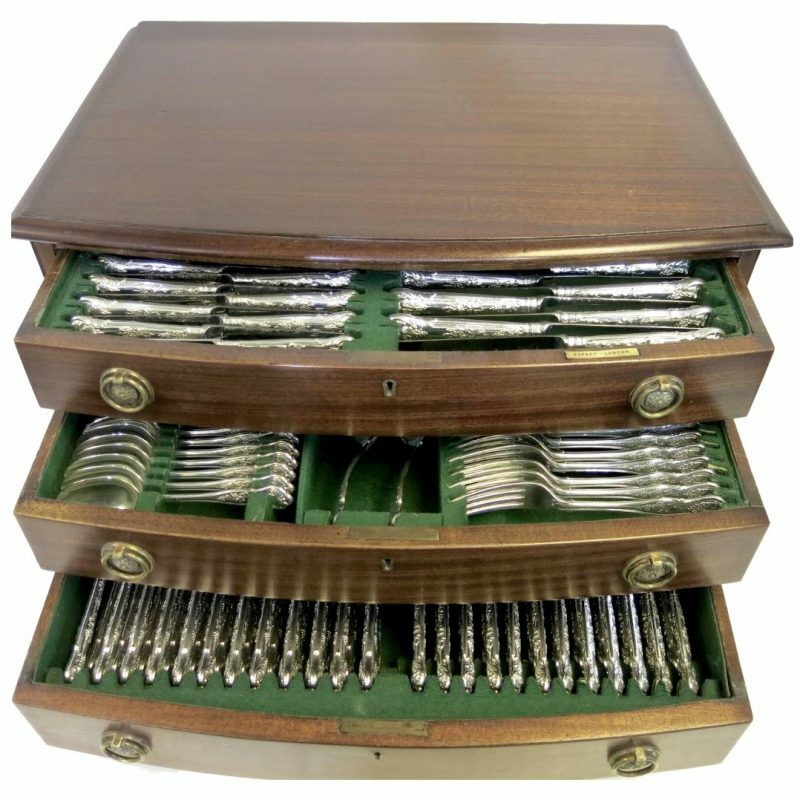 English, sterling silver, 'Bright Vine' flatware set By Asprey & Co, London. Purveyors to the crown. This is a very rare pattern, and is beautifully hand-forged. 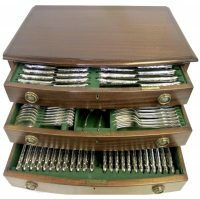 The set is fitted into the original three-drawer cabinet, complete for 12 people with a selection of 17 serving pieces. Set consists of the following; 12 table knives 10.25" (stainless blades). 12 table forks 8.25". 12 soup spoons 7.125". 12 fish knives 8.5". 12 fish forks 7.75". 12 salad / dessert forks 7.25". 12 dessert spoons 7.25". 12 cheese / dessert knives 8.75" (stainless blades). 12 cake / fruit knives 7.5". 12 cake / fruit forks 6.5". 12 tea spoons 5.25". 12 coffee spoons / demitasse 4.33". The serving pieces consist of the following; One knife sharpener 13" (steel blade). One meat carving knife 13" (stainless blade). One meat carving fork 10.75" (stainless blade). One fowl carving knife 11.25" (stainless blade). One fowl carving fork 9.25" (stainless blade). Two piece salad servers 11". Two gravy ladles 6.25". Four serving spoons 8.25". Four serving forks 8.25". A total of 161 pieces. Complete for 12 people. I also have two other sets for 12 people, in this rare pattern, so you are able to add to this service if you would like to seat 24 or 36 people. This is a very rare pattern to find, and condition is near perfect. Excellent hand-forged pattern, excellent maker, great condition. The case measures 24" x 17" x 14" high. Asprey was founded in 1781 by William Asprey, originally based in Mitcham, Surrey until the company moved into its current New Bond Street premises. Queen Victoria awarded Asprey a Royal Warrant in 1862, and in the same year Asprey was also awarded a Gold Medal at the International Exhibition. Asprey continued manufacturing and eventually in the mid 20th century, moved the workshops above their New Bond Street store. 24" x 17" x 14" high.